Not So Daily Art Fix: The Mario Bros. Setting aside the fact we have fallen off a little bit on the daily art feature, it’s only fitting to return with Nintendo’s mascot featured in some of the best fan work I have ever seen. 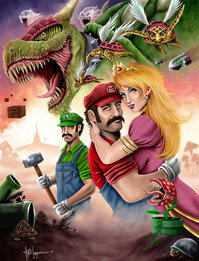 Mario and Luigi have never looked better, and Bowser has never looked more menacing. This is the sort of realistic art style I love to see in fan work. This epic piece was created by deviant art member LabrenzInk.